The process of conducting research and development trials with new pharmaceutical drugs is expensive and risky. It is not uncommon for a drug to fail at the human testing phase even though it passed petri dish and animal trials without problems. Finding a way to introduce rapid, safe testing into the process would allow new life-saving medications to enter the market faster, and along the way save potentially millions of dollars. A new technique bridges the gap between animal and human trials. exVive3D™ bioprinted human tissues are constructed from tiny building blocks of living cells that are lab-formed and designed to mimic key aspects of real-life human tissues. In essence, the technology builds functional tissue that enables data to be captured safely in controlled environments during trials. Testing can be conducted more cheaply and earlier with exVive3D™ bioprinted tissues. Getting this vital step closer to human trials without incurring the full expense allows more drugs to be tested with the same resources, and with greater confidence of success and FDA/authority approvals. Organovo is the organisation based in San Diego, in the US, bringing exVive3D™ to market. The company offers human liver tissue to order – allowing pharma companies to test toxicology, gene/protein expression profiling, and other assessments essentially in vitro. In the future, Organovo plans to expand the bioprinted range to enable safe drug testing with kidney, skin and even cancerous tissues. Organovo is open to partnerships with medical centres, academic institutions and commercial companies to create tissues for both in vitro and therapeutic uses, and is currently working with L’Oréal’s Technology Incubator to undertake further research in skin remodelling. 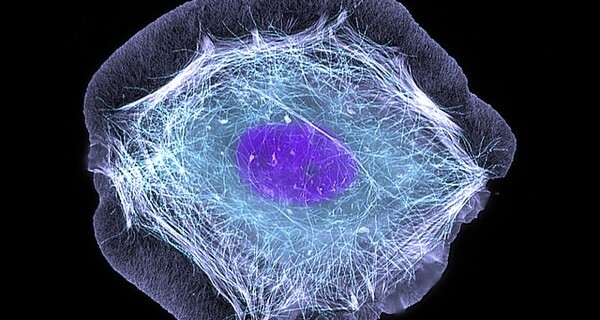 Image 'Skin cell' courtesy of ZEISS Microscopy.